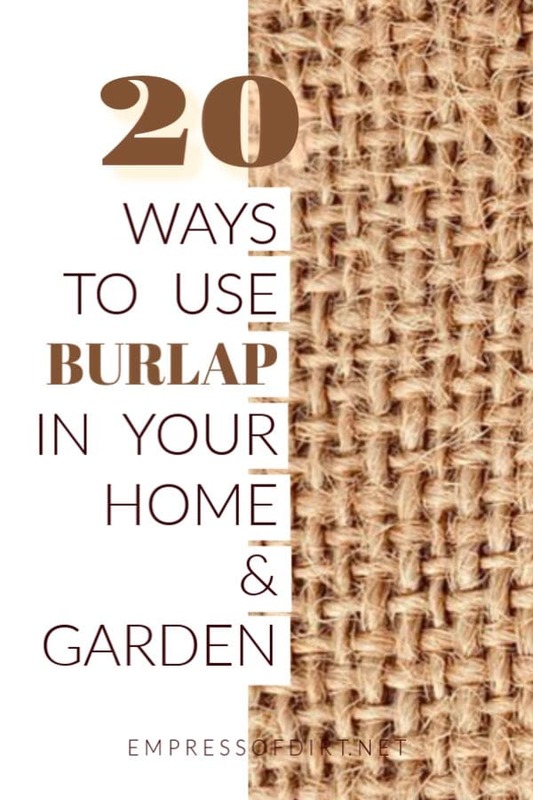 There are countless uses for burlap in the home and garden. This natural, woven fabric is excellent for crafts, decor, protecting plants, lining flower planters, growing potatoes, and more. In some parts of the world burlap is called hessian or jute. Find out what you can do with it. Depending on where you live, you may know it as burlap, hessian, or jute. Burlap is a woven fabric made from natural materials. The most common source is the jute plant, but there is burlap made from other plant sources as well. The name is not protected so you might also find burlap made from synthetic materials. I only use the natural stuff. You’ve probably noticed how popular burlap has become in recent years. I’m sure a lot of this came from the farmhouse decor craze (sorry, couldn’t think of a more appropriate word!) using this unique fabric for everything from cushions to curtains. The natural fibers provide beautiful colour and texture for grain sacks, ribbons and bows, faux flowers, wall-hangings and more. Years ago I was given a giant roll of burlap fabric for protecting my evergreen shrubs in the winter. Since then, it has become a great resource for numerous creative projects as well. One year I sewed a bunch of giant sacks and grew potatoes in them. I also like it for DIY projects which I’ve listed below. There is a lot of different burlap fabric available and the right kind will depend on what you’re doing with it. If you prefer natural fibers like I do, be sure you’re getting all-natural burlap and not a synthetic, which may be sold as ‘burlap-like’, or ‘burlap-inspired’, and so on. Burlap fabric ranges from a very loose weave to a dense, watertight weave. Generally, the looser the weave, the lower the cost. For short-term garden projects, I use rolls of the inexpensive stuff. For home decor, I choose the better, long-lasting stuff. You may have to shop around for a good deal, though. Scroll down to the Burlap Shop for sources. Here’s some DIY projects and ideas for using burlap. and the classic potato sacks for races! A good list of ideas and garden hacks with practical and creative uses for burlap. Here I used burlap scraps entirely for the natural texture, which works nicely for this quirky owl. The burlap in this planter is a cheaper alternative to those coir liners that can get a bit pricey to replace. I saw this planter on a garden tour. It’s a really simple project but the addition of the burlap just makes it work. This is a wonderful project from Jessica Walliser’s Book, Container Gardening Complete. The burlap is not a main focus here, just a nice touch. This project uses clear glass containers to create bird baths, and, to make them interesting, I filled them with various things including burlap fabric. This is one of the most common ways I use burlap: to line unusual garden planters. Because it’s fabric, it can be shaped for any size and shape, holding the potting mix in place yet allowing drainage: perfect. If you enjoy creative and frugal home and garden ideas, be sure to get your free Empress of Dirt Newsletter here.